' conjured a world of pure, blissful emotions enraptured by nature, and it surely didn't hurt that they were incredibly catchy at the same time. 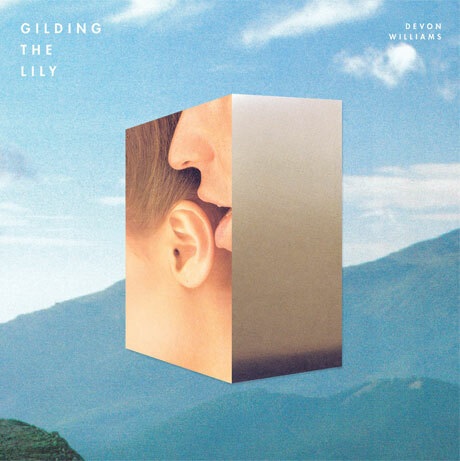 Williams takes some cues from the big names of the era, and though one can occasionally hear echoes of New Order and The Chameleons in the more energetic rhythms and electric guitar-lines on Gilding the Lily, he seems equally influenced by bands like Felt, Care, and the Field Mice, who were often comfortable focusing on their own emotional vulnerability. This pairing works quite well throughout the album, making its songs feel simultaneously intimate and epic, like the album's cover. Williams has a tendency to begin a song softly before letting it grow into something powerful. On highlight 'Games', a delicate acoustic guitar pattern gives way to full-on strumming as the song transitions to a moving and memorable chorus. With an added female vocal harmony, 'Deep in the Back of My Mind' could be a lost Prefab Sprout single circa Steve McQueen, while the second half of the driving title track deftly builds to a refrain you wish would go on for 10 minutes more. You'd be tempted to describe some of the tracks on Gilding the Lily as missteps without listening past their one minute marks, as songs like 'Around in a Maze' and 'All I Have to Do' come off more like standard Britpop than post-punk or dreampop, creating what seems to be an uncomfortable amount of stylistic variety on the album. But these lushly-produced songs manage to be so enjoyable that it's difficult to fault them just for being different. His music may not have the wide-eyed purity of Sarah Records in its prime, but Devon Williams succeeds in bringing the listener back to the same epic landscapes - emotional as well as geographic - they were trying to take us to in the first place.